These iron on name labels for clothes are a great size. Great for any clothing items that need a permanent, iron on label. So easy to apply, it only takes 15-20 seconds! These personalized iron on labels are great for all types of fabrics. Our Iron On Clothing Stickers are great for all types of clothing and fabric. 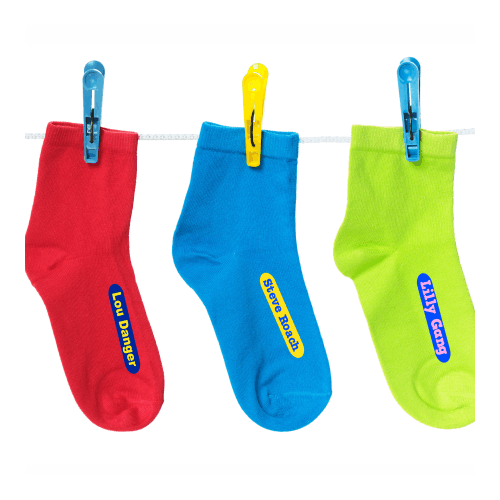 Great for items with or without a garment care tag.Our customers love to use these personalized iron on labels on socks, underwear, tagless t-shirts, towels and more! To apply this iron on label for clothes, peel the label from the backing, place on clothing, cover with included sheet and press with a hot iron for 15-20 seconds. That's all there is to it! 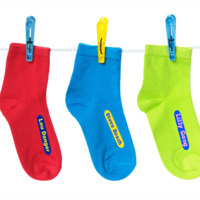 Our iron on name labels for clothes are washable and will hold up wash, after wash, after wash! 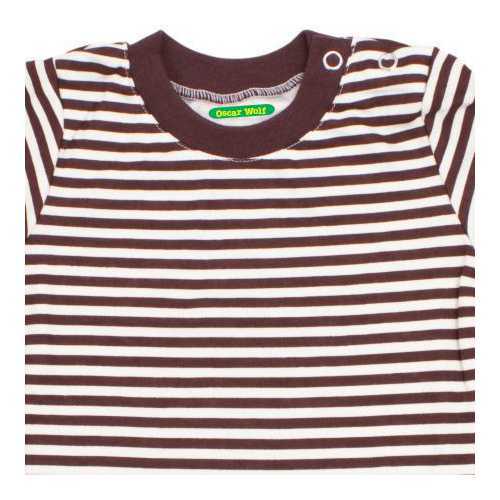 See all of our kids clothing labels & Iron On label sizes, or Create Your Own Labels here! 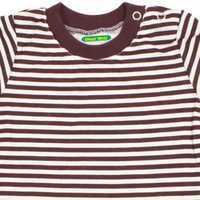 Product Safety Information Our Thin Rectangle Iron On Labels SHOULD BE APPLIED BY AN ADULT. All of our labels are made with non-toxic materials and eco-solvent inks. 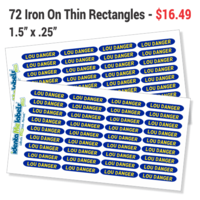 Our iron on labels are a permanent labeling solution. Keep an eye on the labeled items if they're going to be used by young children to make sure that they stay intact and are not accidently ingested. 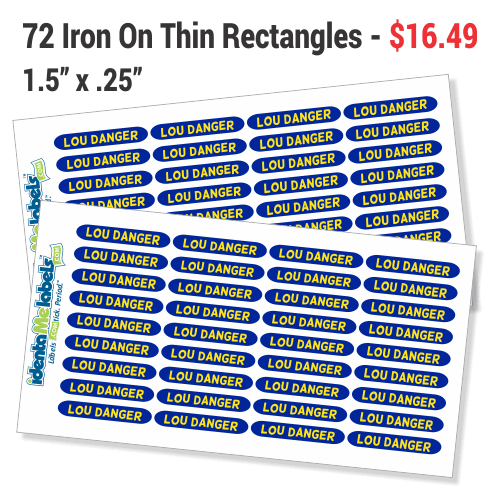 Our Iron On Thin Rectangle Labels are laundry safe. Your Thin Rectangle Iron On Labels will ship using USPS First Class mail unless you choose one of our faster options when you checkout. The faster options are USPS Priority, USPS Express, and FedEx Three Day. We can also ship your labels using UPS or other FedEx options - just give us a call and we can work out the details and the cost with you. If you'd like to provide us with your UPS / FedEx account number, we'll have your account billed directly. "Your labels have helped me out a great deal. facility and they are constantly doing laundry. Don't know what I would do without the labels!"